It was a beautiful, brisk fall day and as I drove through Port Gamble, with its avenue of maple trees, I made a note to myself (which I had better write down today) to go back in a week when the trees will be "in full color." As they are already turning, I know I only have a few days to capture it. As usual the ferry ride over from Kingston to Edmonds was lovely; one of the things I will miss about living up here. But not enough to make me stay! And Waze took me the back way, through residential areas, avoiding the freeway, down to Ballard, a throwback Scandinavian area that unfortunately is losing its identity as it becomes more gentrified. But I wasn't there to site see, but to visit two tiny (in physical aspect, not in character) distilleries for a couple of articles for American Distilling Institure. The first one, Old Ballard Liquor Company, is located right down in the industrial area near on the docks. It's a tiny 750 square foot, industrial-looking place that produces a variety of authentic Scandinavian-style aquavit (AH-kwa-veet or AH-ka-veet). The owner, Lexi (just Lexi, like Adele or Beyonce) is a livewire! Full of information and spirit - the personal kind, not the kind she makes! 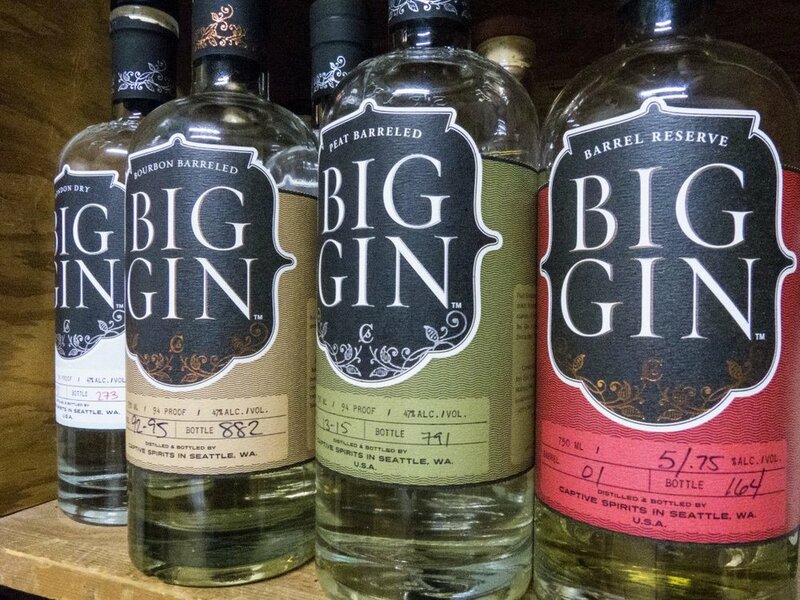 I learned a huge amount from here about the state of the Washington State distilleries and the battles they have to fight with an obstinate, un-moving, OWM-run bureaucracy. And how difficult it is to survive and actually make a go of it. While I was there, she got a text from one of the other local distillers saying another distillery was closing its doors and one, Seattle Distillery is for sale! It's very sad when government is so rigid and prevents new endeavors from succeeding. Lexi is passionate about her products, which I tasted and the flavors are surprising! Nothing like any aquavit I have tasted before, but then I think I have only had it a couple of times! Apparently, Sweden, Norway and Denmark all have their signature flavors and Lexi manages to cover them all. I think my favorite was the Älskar, "citron flavored aquavit, nuanced with notes of caraway, coriander, grains of paradise and other spices." And I also tried her Cherry Bounce, which has a long history in this country. It's made with sour cherries to create a delicious liqueur and reminded me on the blackberry brandy I made last year. For locals, you can get there by boat, with free moorage at 14th Ave NW boat launch. Second stop was at Captive Spirits Distilling, where they produce Big Gin. They are tucked away in a residential area and like most of Seattle, apparently, parking is at a premium! I drove around the block a couple of times before realizing I could park in the no parking zone in front of the building. As Ben and Holly are not open to the public, except by appointment, they don't have to deal with visitor parking. But they are moving to a bigger facility soon down on the Ballard docks. The cement floors were just poured and they are, justifiably excited! I was greeted by Holly and Rosie, the very sweet distillery dog! Then spent a fascinating 90 minutes with Ben, a third generation distiller (his dad and grandfather made moonshine), hearing about how they got started, his partners, their philosophy of producing just one product - GIN! And about their recent partnership with Hood River Distllers, which will help take Captive to the next level through their extensive distribution channels. Leaving Captive, Waze once again routed me through the residential area, but even there, the traffic was horrendous and living up to its reputation of the 2nd worst in the country! And I dreamed of that gin and tonic waiting for me at home!